Welcome to another fun-filled day on Royal Caribbean's Allure of the Seas! Today is our second sea day and it was a combination of relaxation and trying new things. We decided to do what most parents do and let the kids be the alarm clock. Oddly, they decided to wake up before 8am so our hopes of sleeping in were dashed. After getting the troops ready, it was time for breakfast in the Windjammer. Surprisingly, no lines this morning despite rolling in around 9am. I suppose others had better luck sleeping in. After breakfast, we headed back to the room for some playtime for the kids and an ealy nap for our youngest. The older one went to Adventure Ocean. I took the opportunity to try something completely new, a ride on the zip line. On Allure of the Seas, the zip line is complimentary and the lines were fairly short. It was a quick process to get signed in and suited up and I was feeling good until just before I got to the launch platform. As I approached the go-point, I started to get nervous but figured I had gone too far now to back up. The crew member directed me to sit back in my harness and go and it was a really fun ride the other side of the deck. I ended up riding three times in total and once you are suited up, it is fairly easy to ride again because the lines were for guests getting suited up. I managed to knock out three rides in about 20 minutes. Following zip lining I collected my daughter from Adventure Ocean and got her lunch from Wipeout Cafe. My wife let the kids run around our room while I headed down to Izumi for lunch. I was privilidged enough to have Chef Travis Kamiyama indulge me in a special meal, as he boarded the ship yesterday. Chef Travis is the man that literally invented Izumi and is responsible for its rapid spread and success across Royal Caribbean. As many of you know, I really love Izumi because I can never get enough sushi and Izumi serves up some fantasic options. Following lunch, the family and I headed down to the Boardwalk for a group cruise meet up, where we enjoyed the many treats of the Boardwalk. We tried different snacks and experiences on the Boardwalk and really had a great time exploring this amazing area. We followed it up with a cabin crawl, where members of our group allowed us all to see their stateroom. The highlight was the one bedroom AquaTheater suite , which was terrific. It was great seeing the various staterooms and seeing some new options. The rest of our afternoon was spent relaxing in our room and letting the kids nap. By far the best thing parents can do is let their kids take naps if you want even-keeled behavior later on. Tonight was our second formal night and we dressed up for the occasion and took some photos around the ship. We even found Alex the lion in Central Park posing for photos! Our evening plans were simple: feed the kids and drop them off at Adventure Ocean and the nursery, followed by dinner at Izumi and our first visit to the Prohibition party. After dropping the kids off, we spent some time in the Boardwalk exploring and enjoying a really fun water fountain show in the AquaTheater. The water fountain show was a complete surprise, but something really fun and different. I really loved the musical selections. Dinner was at Sabor, and despite eating there a few times earlier this week, this was the best Sabor meal of the cruise. We tried a lot of foods and the food across the board was really quite good. I think the the tuna tacos are not only the best tasting food on the menu, but an excellent value at only $5 for three tacos. I tried for the first time on this cruise the tortilla soup and mole short rib. The tortilla soup was great (and had a good spicy kick to it), while the short rib was missing that great flavor I was expecting. In my opinion, it is tacos or bust when it comes to entrees. And for those keeping score at home, the key to excellent guacamole at Sabor is tied to the amount of lime you get. The more, the better. We also indulged in a tequila flight, which offered a number of different tequilas to taste. All of them are smooth and I dare you not to feel really good a few minutes after trying them. I will post a full review of Sabor later, but I really liked dinner here and I think we all loved the experience. The food was really tasty and I like many of the menu options. After dinner it was time for the Prohibition Party. The Prohibition Party is basically a music event that includes alcoholic drinks for $35 per person. You arrive, get a "password" to get in and are seated to enjoy the festivities. Most, if not all, the guests dressed up in 1920s garb and it was really a very fun and different event. What I like about the Prohibition Party is it was something really different and I think anyone that thinks the idea of getting dressed up in their best flapper outfit combined with lots of drinks sounds good, this is the event for you. My wife and I had a blast at the Prohibition Party and only regret it was not a bit longer. Nonetheless, we collected exited the event and got our kids from Adventure Ocean and all went to bed. Tomorrow we are making our last port stop in Cozumel, Mexico. The weather today turned overcast around noon and never rained, but looked like it might. For the first time this cruise we had some noticeable motion in the ocean. Nothing crazy, the cruise had been incredibly smooth up until yesterday so feeling a little motion was interesting. My oldest daughter loves to find those Small Wonders hidden all around the ship! Today is our second port day of the cruise, and we are visiting Falmouth, Jamaica. Allure of the Seas was not scheduled to dock in Falmouth until 10:30am, so we had some time to sleep in and get ready. We got the kids ready and went up to the Windjammer for breakfast. The Windjammer after about 8:30am usually has lines to get in and this morning was no different, although the lines do move quite quickly. I was surprised to find there is no omelette station in this Windjammer. I asked a crew member and was told there was none, and that was odd to me considering there is an omelette station on all other Royal Caribbean ships' Windjammer that I have been to. Nonetheless, breakfast as good and coincided with arriving into Falmouth, right alongside Independence of the Seas. We had booked a shore excursion prior to our cruise, Blue Waters Beach Escape. We booked it because it was close to the port (10 minute drive), offered what looked like a beautiful beach and the cost was not terribly high. We met our group in the designated spot, signed waivers and boarded a bus. It was really hot out but luckily the bus had great air conditoning. I will do a more formal review of Blue Waters later on, but the experience is essentially what the description lays out. It is a great beach for someone looking for an excursion with a short drive, nice looking water and a psuedo-all inclusive feel. Unfortunately, two factors soured my experience (and neither were something that could be fixed): my kids were both in bad moods from lack of sleep and it ended up being really windy. We made the best of our time there, with the highlight being both children sleeping. There were regular buses back to the port area, which was quite nice to not be locked into a particular schedule. Back in Falmouth, we did a little shopping but went back to the room to shower. I opted to delay that and take my oldest daughter for a swim in the pool. We had not gone for any swims yet, so figured this was a good opportunity to jump in. The kids pool area is quite large and a lot of fun for kids. We returned to our stateroom for a shower and while the girls got ready, I opted for some "pre-dinner". I tried to Izumi but it was not open yet, so I went to Sabor. Say what you will about Sabor on Allure of the Seas, one big benefit of an a la carte menu is I can drop in for a bite without a large investment. I got my favorite dish, the tuna tacos and at only $5, it is a tremendous value. I did a little walking on the ship as I made my way back to the room and noticed the Guest Services staff were in the "island mood" and even stopped for a character photo. We dropped the kids off at Adventure Ocean and Nursery and I headed down to Central Park for dinner with some RoyalCaribbeanBlog readers at 150 Central Park. This was my first time at 150 Central Park, and it is the signature restaurant onboard that is designed by celebrity chef Michael Schwartz. Our meal consisted of six courses that were all prepared by the chef and I really found the entire experience intriguing and really tasty. I will post a full review of 150 Central Park later, but rest assured it is a great meal for anyone looking for a fabulous dining experience with exquisite service. Following dinner we decided to check out a show at Jazz on 4 that starred the cast of Mamma Mia!. Essentially, the show was each cast member going on stage to sing various Broadway songs and my wife absolutely loved it. We swung by Adventure Ocean and the Nursery to pick up the kids, went back to our rooms and all got ready for sleep. Tomorrow is a sea day and we have some really fun things planned! Today is our first port stop, and it is at Royal Caribbean's private destination of Labadee. I really love Labadee because of its natural beauty and enjoyable beach activities. I also realized my wife has not been back to Labadee in a number of years, so we were all looking forward to a fun day at the beach. Allure of the Seas docked at 8am, as any parent knows, getting your kids dressed, ready for the beach and fed is no easy task. We had breakfast at Park Cafe today and it is great for a quick breakfast without much fuss. Park Cafe is in Central Park and offers egg sandwiches, a bagel bar, cereal, various coffees and plenty of pastries. It is good for grabbing a cup of coffee and a bagel and getting on your way. Disembarkation at Labadee is super simple, and we went from ship to shore in just a few minutes. I was also pleasantly surprised to find no lines getting off the ship (for the elevators or the gangway). We had rented an over the water cabana at Labadee at Nellie's Beach. We reserved it so we could have a "home base of operations" for our kids where they could relax somewhere in the shade as well as take a nap. The cabana is a total splurge, but it is something I really enjoy having. I cannot say from a value proposition it is a slam dunk deal, but it is great having a lot of sand-free space to enjoy. And the views are pretty amazing too! We spent the day swimming, laying around and repeating as necessary. We also got together as a group to enjoy one of my favorite drinks, the Labadoozie! For lunch, they drove us to the buffet and the beach buffet is never my favorite meal by any means, but we made the best of it. We had absolutely perfect weather with barely any clouds in the sky. Temperatures were in the 80s and it was great for swimming! Fast forward to about 2:30pm, we asked for the cart to come get us to bring us back to the ship. Luckily, not much of a line to get back and we were quickly back onboard showered, changed and napping. I was a bit hungry given that I did not eat a whole lot on Labadee, so decided to indulge in some "pre-dinner". I was surprised to find that Sabor was open on the Boardwalk a good 45 minutes earlier than it was listed to open. Nonetheless, I headed down there for a snack. I kept it simple this time: tableside guacamole and tuna tacos. Fabulous and really tasty! Feeling better now (Sabor makes everything better), I went to meet a friend that gave me a tour of the Diamond lounge. The Diamond Lounge is for guests that are at least Diamond level in Royal Caribbean's Crown and Anchor Society and it is a special spot for them to congregate and enjoy time in at their leisure. There is complimentary drinks and food available as well. The Diamond Lounge on Allure was quite large and I was impressed by its size. After this cruise I will turn Diamond, so I am looking forward to enjoying these sorts of perks. We dropped my youngest daughter off at the nursery next and then took my older daughter to the AquaTheater to check out OceanAria. OceanAria is essentially a show that showcases aerial stunts that involve diving into a pool and some of physical feats are truly impressive. I liked the pacing of OceanAria, which never stuck with one scene too long (some of the ice skating show routines can linger a bit longer than I prefer) but the show itself was not exactly my favorite just because it is more a spectacle than anything and has very little in the way of story. All that being said, it was a well-performed show and I really was impressed by the performances. After the show, we took y daughter up to the Windjammer for dinner. We had a great little Royal Caribbean moment there, when I inquired about where I could get her a hot dog and seeing as there were none, a manager made an immediate call to get some for her from elsewhere on the ship. Not even five minutes later, two hot dogs were delivered to us. Wow! We dropped my oldest at Adventure Ocean and headed to the main dining room for Italian night. I really like the menu here, especially the lasagna. It was a great meal that did not disappoint! Following dinner, I was really feeling wiped. I think a couple of days of going at full-steam and a full beach day have finally caught up with me so I decided to get some sleep. My brain loves the idea but my hear is yearning for at least 3 more activities today. Oh well! Tomorrow we will be in Falmouth, Jamaica and taking an excursion I have never done before. Thank you as always for following and please let me know if you have any comments or questions in the comments below! The Voom internet is seriously fast. I am continuously impressed by how well it performs. I learned last night that some of the ambient lighting and all the sound effects in Central Park are turned off exactly at midnight. During the course of the main dining room, they repeated announcements in Norwegian. That was a first for me on a ship to have that language selected for a translation. Best place for Scotch lovers is Champagne Bar (or so I am told from friends that love the stuff). The nursery receipts have no gratuity line on their reciepts so I am not certain the best way to reward the excellent service I have received beyond the multiple, thank you's I have given them already. I started my first full day on Allure of the Seas rather early when at 6am I was awoken for some reason and thought I could not go to sleep. Laying in bed, I thought I should follow through on the promise I made to myself to see another sunrise on a cruise, so I got myself dressed and headed out of the room to check it out. Sure enough, it was quite lovely to see, even with the clouds present. Plus, you get the feeling of having the entire ship to yourself! I did a little walking around and came back to the room to sit on my balcony but I ended up falling back asleep on my bed and what went from an early morning turned into a late morning, as I got out of bed around 9:15am. Once awake (again), I got my oldest daughter dressed and brought her to the Windjammer for a quick breakfast and then took her to Adventure Ocean. Then it was back to my room to collect my wife and other daughter. We had aspirations of going to the Welcome Back party in the Aqua Theater, but hunger won out and we went to Johnny Rockets for breakfast. On Royal Caribbean's Oasis class ships, Johnny Rockets is open for breakfast and is complimentary (there is a cover charge for Johnny Rockets for lunch and dinner). It is a standard American breakfast, but usually has far less crowds than the Windjammer. We had a nice breakfast there and then grabbed Starbucks before continuing on. I really love having a full Starbucks onboard! We decided to do a little parenting handoff, with me watching my youngest daughter while my wife went to get a pedicure at the spa. While my daughter napped, I took an opportunity to do some blogging and live Periscope on my Central Park balcony. Love it! At noon, we collected both kids and headed down to the Boardwalk for a special event to thank everyone that booked into our group cruise. I like to reward folks that support this blog and today, we invited everyone that booked into our group cruise booking group with a complimentary lunch at one of my absolute favorite restaurants, Sabor taqueria & tequila bar! I think we had a great time sampling a lot of the food at Sabor and enjoying it with the group was a real pleasure! Following Sabor, it was time for a group event, the most civilized bar crawl. Basically, we had drinks at a few different bars together and it was a good opportunity to sit back and get to know each other. And enjoy some great drinks. We visited Sabor bar, Rising Tide, Trellis Bar and Schooner Bar. I think it is safe to say a good time was had by all. Tonight is formal night, so following the drinking, I headed back to my stateroom to get ready for dressing up, photos and dinner. I have often said that I really like formal night, because it is one of the rare opportunities to get dressed up these days without it being a wedding or funeral. Getting two children dressed is no simple task, but we managed and got some great photos. I found there to be very short lines for formal night photos. I think it helped we went between dining rotations. For tonight's dinner, we "called an audible" and skipped the main dining room for dinner at Izumi. We did so because my wife had tickets to see Mamma Mia! and the show time would have made our dining room time virtually impossible. So after dropping the kids off at Adventure Ocean and the Nursery, we booked Izumi for dinner and off we went. Izumi on Allure of the Seas is very similar to Izumi on most Royal Caribbean ships these days. The menu is fairly standard and so are the selections. The main difference on Allure of the Seas is Izumi offers an hibachi dining option. This time around, we stuck with traditional Izumi. I ordered my usual (DX Sushi Combo) along with a yellowtail roll, while my tablemates ordered various dishes. I will offer a more detailed review in the future, but we had a great experience at Izumi and the food was of great quality. Following dinner, my wife went to see Mamma Mia! and because I had seen it previously on Quantum of the Seas, I played the role of Mr. Mom and picked up the kids and put them to bed. On my way to pick them up, I partook in a little Central Park time (it was sort of on my way) and there was a great band playing music in the park that really made my night. Picking up the children was quick and luckily they all went to sleep quite easily. The great thing about cruising is it wipes them out! Tomorrow we will be spending the day at Royal Caribbean's private destination of Labadee and I cannot wait to enjoy pure serenity! Probably not news to anyone, but the ship is really empty around 6am. The nursery allows parents to book a certain amount of hours in advance, but after day 1 and 2, parents can drop off kids if there is extra capacity and not affect their booked reserved times. I am always intrigued by the make up of guests on a cruise I am on, and we are seeing a lot of international guests, primarily French and Brazilian. Also, since school is in session again after vacation last week, a lot of older guests. Pro tip I heard about today: if you book a cruise with NextCruise, you can go to the shore excursion desk and the staff will book excursions for that cruise you just booked! This can not only be a good planning technique, but also good way to use onboard credit. Waking up super early for sunrise is a great idea at the time, but invest in Starbucks during the course of the day! Hi everyone, I'm really excited to announce our next live-blog experience as we get ready for a cruise aboard Allure of the Seas for an 7-night Caribbean adventure. It is my hope to provide to our readers a daily look at what this cruise will be like and share our experiences with you. This means I will try to post photos every day along with a written report of how things are going (internet permitting). If you're new to our live blogs, check out the live blogs we did for Freedom of the Seas, Quantum of the Seas and Navigator of the Seas for an idea of what's in store for you. I'm hoping to give our readers a daily look into what we did that day, what was good/not good and what we have planned for the next day. For this cruise, I will be driving to Fort Lauderdale to start our adventure. Coming from the Southeast United States, this will be an easy drive to the port with the family and we will arrive the day before our cruise to ensure we have no issues with being present for embarkation day. As many of you know, this cruise was planned as a group cruise among readers of Royal Caribbean Blog and I cannot wait to meet up with everyone onboard the ship and share in exploring Allure of the Seas together. Ever since I planned the group cruise, I've thought the idea of cruising with other Royal Caribbean fans would be a lot of fun and we had a fabulous time for the first ever Royal Caribbean Blog group cruise on Quantum of the Seas. We are planning to arrive to the Fort Lauderdale area a little after lunch and check into our hotel, Cambria Hotel and Suites. We chose this hotel for its location near the port area, as well as offering suite accomodations for our family. The day before the cruise, we have organzied a meet up at John U. Lloyd Beach State Park on Saturday, February 20th at 3:45pm to watch Oasis of the Seas (and other cruise ships) leave. If anyone is in the area, please feel free to come on by and join us! 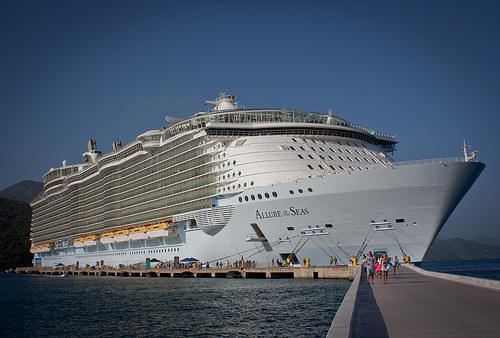 The next day, I will board Allure of the Seas as early as humanly possible and start the real fun on February 21st! This is my first time on Allure of the Seas, although I had sailed on her sister ship, Oasis of the Seas back in 2010. Given how long it has been since I have been on an Oasis class ship, it is clear the experience on Allure of the Seas will feel like something brand new. Allure of the Seas offers so much to see and do onboard, and my family is excited for the opportunity to enjoy so many of the activities we have read and heard about over the years. Of particular interest are the specialty restaurants and many shows onboard. We booked a number of firsts for us, including the prohibition party and Dinner at 150 Central Park. We also have reservations for a number of the shows, so there will be plenty of opportunities to do new things. Of course, our two children will be a focal point of our experiences onboard. My kids being 5 and 1 years old, we will have a pretty good look at the activities for children onboard and we are all really excited to enjot it all. 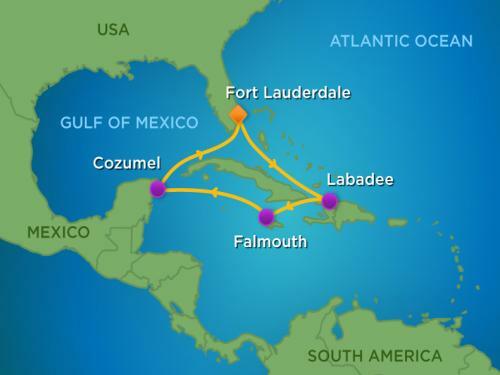 In addition to the ship, we will visit three popular Western Caribbean ports of call: Labadee, Falmouth and Cozumel. We have been to all of them in the past, and planning on mixing in favorite excursions along with some new stuff too. I will share what we end up doing in each port, as we have purposefully left a bit of ambiguity to our shore excursions to give us more flexibility. Of course, I hope you will be joining for me on this cruise virtually. If you have any questions for me while I’m onboard, comment in the post below, email or twitter me, and I’ll do my best to answer. I will also be doing daily broadcasts on Periscope, so be sure to watch there! Next update should be on our embarkation day, Sunday, February 21. Stay tuned for all of our live blog updates right here. Have a question about Allure of the Seas? Want Matt to cover something specifically in the live blog series? Tell us in the comments!